Hi, Andrew here from Accelerate Auto, Electrics and Air Conditioning. I just had a look down in my workshop and realised we’ve got five 200 Series Toyota Landcruisers getting fit outs today. It’s actually not that uncommon for us at the moment. So I thought that we’d do a quick video, we’d do a runaround, and then this afternoon, we’ll show you what we’ve been busy doing today. This is one of the ones that we’ve finished today. This one’s had pretty much one of the most common jobs we do to these 200’s. What we’ve done today is we’ve installed a second battery using a genuine second Toyota tray. This is actually the version that only came out with one battery, if you know. So we’ve used the genuine second tray in the other side. And we generally end up installing some kind of light bar or spot lights. We’ve done a few of them. I’ll show you them later, but this has got the Titan Light Bar on it. We’ve installed that today. We’ve installed the REDARC BCDC1240. We’ll show you some close ups of that mounted behind the grill to help its cooling. We’ve installed an RACQ Deep Cycle Battery on this one. The reason why is the customer’s a tourer, and obviously with RACQ, nationwide warranty, no better battery for a tourer out there. Doesn’t have all the bells and whistles, but will definitely do its job, and anywhere you are in Australia, you won’t have an issue. We’ve also installed Anderson Plug that we’ll show you down the rear, and various outlets in the back. As I said before, we’ve used the factory Toyota tray. We do this ’cause one thing that’s very important with these systems is to use at least 105 amp hour battery. There are other systems around where they fit a smaller battery up in the back corner. You just do not get the fridge run time that everybody’s looking for. With 105, you’ll get at least two to three days, and it’s really what you need in a system. So whenever you’re looking at any different 200 Series dual-battery system, always ensure that you’re gonna get at least 100 or 105 amp hour battery, and then it’s very important with them. We have a lot of customers who are disappointed with the performance when they use a smaller battery. Okay, so here we are down the back of the car. The main reason why we installed this dual-battery system is so the customer can run his fridge and charge various things at the back here. So the reason why we’ve got four outlets is we’ve got a cigarette socket, and Engel and a USB socket, and a volt meter to top it off. Okay, so one other thing we’ve done on this vehicle is they come out with a factory cigarette lighter that’s obviously wired to ignition. We’ve replaced that cigarette lighter with a dual-USB port that’s actually wired to the auxiliary battery permanent power, so that means you can charge your iPads and so on with the ignition switched off, or anybody in the back has constant power to running any sort of devices like that while you’re travelling. We’ve also run an Anderson Plug. The reason why I’m showing you this one is we actually use the Trailer Vision Anderson cover. It’s really neat. We don’t see many people using these, but we think it’s pretty much a necessity on the back of such a good-looking car. I’m gonna show you yet another 200 Series Toyota Landcruiser Dual Battery System fit out we’ve done today. This one, we’ve used the Supercharge All Rounder 105 amp hour battery. So again, that’ll give you two to three days running with your fridge in the rear. We’ve also fitted some King Spotlights. Always a challenge, but they’re going on quite well. And this one, we’ve used the REDARC 1225 BCDC in the front. And that’s really most of it. We’ll show you some close ups of what we’ve done in the bonnet. Okay, and here we are down the back of the vehicle. Now, it seems to be our standard, but we keep having our customers want to do it this way and see it this way, and we keep doing it. So what we end up doing is cigarette socket, Engel socket and then dual USB socket with a volt meter, as well. Seems to work quite well. Give customers all the options. One thing we do a bit differently is we run a couple of separate feeds down here. You’ll find sometimes it’s easy just to run one feed and loop it all up. What that means is if you have a problem in one circuit, everything goes, so you’ll notice up the front, there was a couple of different fuses. And that fuses this all individually. Okay, and another touch that we’ve added to it, even though we fitted the Kings Spotlights, we actually have fitted a factory looking switch, rather than using the one supplied with the kit. We used this and it makes it a much more professional install and actually fits in with the other switches quite well. If you want any more information on 200 Series Toyota Landcruiser dual battery systems, light bar installations, or you have any questions in general that need to be answered, feel free to comment below, contact us online or give us a call on 1300-227-353. In today’s video, we feature a huge job that we completed on recently, the Ultimate Land Rover Discovery 4 Towing Setup for connecting up a new caravan. I’m gonna take you on a quick tour around it and let you know what we’ve installed. The first thing that we have installed for these guys is a reverse camera. The screen for the reverse camera is mounted on the dash. Now, the camera for this is actually on the caravan. What this allows them to do is, while driving they can see behind you and it gives them the vision to see right behind the caravan and usually the two lanes either side. It’s fantastic when you’re driving on the freeway and need to overtake or merging lanes. You can see everything behind you. They are absolutely awesome and one of the must-haves I think when you have a caravan. Next up, we have installed an electronic brake controller. As usual, we recommend the REDARC TowPro Elite. You can mount little dial for these anywhere. These guys have opted to have it mounted just down under the steering column. At the rear of the vehicle, we’ve got several plugs that we’ve installed. The first one is what connects the camera. This plugs into the camera on the caravan and makes it work on the screen in the car. That tucks away neatly in here and we’ve got a plate that goes over the top of it. The next one is the 12-pin plug. This connects everything in the vehicle to the caravan, so you turn your indicators on in the car, it’ll work the indicators in the caravan, also for brake lights and various other things. We then fitted two Anderson plugs here. We’ve got the grey one and that charges the batteries in the caravan while you’re driving. This is a really great option so that you know when you arrive on site that the batteries are fully charged so you can set up to free camp and that sort of thing. We’ve also now got a red Anderson plug here. We use the different colours to differentiate between what you need to connect to them. Red will only connect to red, grey will only connect to grey. And this one hooks up the electronic stability and control or the ESC. That is computerised technology that improves a vehicle’s stability by detecting and reducing the loss of traction or skidding. That means that the caravan that they have purchased is equipped with that. It doesn’t come standard with most caravans on the road. That’s pretty much it, a really simple overview of this Land Rover Discovery 4 and the towing setup that we’ve done for it. If you do need any help or advice on what to set up in your car or caravan, you can give us a call on 1300 227 353 or comment below. Good afternoon everyone, Briohny here from Accelerate Auto Electrics & Air Conditioning on the beautiful Sunshine Coast. Today we’re gonna take you through a job that we’ve done on this Ford Everest. We’ve installed a Redarc TowPro Elite and an Anderson plug. The reason we love the Redarc TowPro Elite is that rather than having a big box that sits under the steering column and you usually knock your knees on it, instead you’ve got a little dial that we’ve mounted really nicely into the dash here next to the gearstick and that way when you need to reach it in an emergency it’s right close and handy. 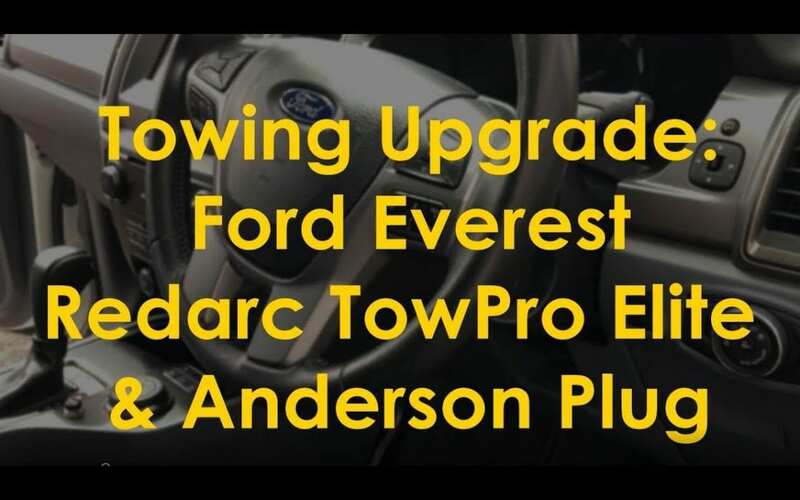 For all the other reasons that we love the Redarc TowPro Elite, check out one of our other videos that we’ll link in the descriptions below. So under the bonnet, we’ve got a 50 Amp midi fuse and a 30 Amp circuit breaker. We’re also running 8 B&S cable that goes directly from the battery through to the rear of the car that hooks up to the Anderson plug. We’ve then got 5 mm cable that goes from the battery into here where it then shoots off to the dial for the Redarc controller and then goes straight to the back again into the trailer plug. So at the rear of the vehicle here, we’ve got the Anderson plug that we’ve installed. If you need any help with towing your caravan or trailers, you can give us a call on 1300-227-353, email us at ‘[email protected]’, or comment below.